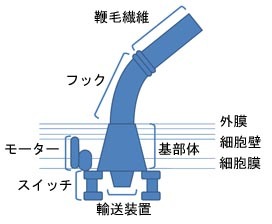 Yoshida, Y. et al. Glycosyltransferase MDR1 assembles a dividing ring for mitochondrial proliferation comprising polyglucan nanofilaments. Proc. Natl. Acad. Sci. USA 114, 13284-13289 (2017). Chang, Y.-G. et al. A protein fold switch joins the circadian oscillator to clock output in cyanobacteria. Science 349, 324-328 (2015). Mocibob, M. et al. Homologs of aminoacyl-tRNA synthetases acylate carrier proteins and provide a link between ribosomal and nonribosomal peptide synthesis. Proc. Natl. Acad. Sci. USA 107, 14585-14590 (2010). Roy, H. & Ibba, M. Bridging the gap between ribosomal and nonribosomal protein synthesis. Proc. Natl. Acad. Sci. USA 107, 14517-14518 (2010). Fujishima, K. et al. 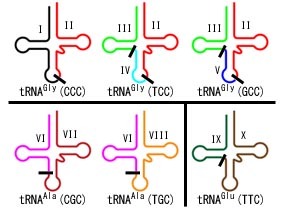 Tri-split tRNA is a transfer RNA made from 3 transcripts that provides isight into the evolution of fragmented tRNAs in archaea. Proc. Natl. Acad. Sci. USA 106, 2683-2687 (2009). Mansy, S. S. & Szostak, J. W. Thermostability of model protocell membranes. Proc. Natl. Acad. Sci. USA 105, 13351-13355 (2008). Mansy, S. S. et al. Template-directed synthesis of a genetic polymer in a model protocell. Nature 454, 122-125 (2008). Huber, H. et al. A dicarboxylate/4-hydroxybutyrate autotrophic carbon assimilation cycle in the hyperthermophilic Archaeum Ignicoccus hospitalis. Proc. Natl. Acad. Sci. USA 105, 7851-7856 (2008). 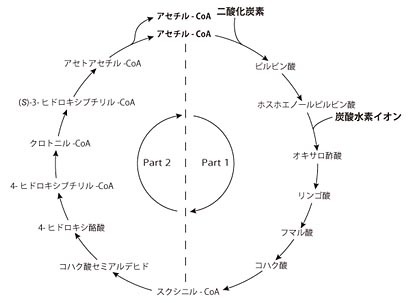 Thauer, R. A fifth pathway of carbon fixation. Science 318, 1732-1733 (2007). Osawa, M., Anderson, D. E. & Erickson, H. P. Reconstitution of contractile FtsZ rings in liposomes. Science 320, 792-794 (2008). Wendt, K. S. et al. Cohesin mediates transcriptional insulation by CCCTC-binding factor. Nature 451, 796-801 (2008). Uhlmann, F. Cohesin branches out. Nature 451, 777-778 (2008). Nakazawa, Y., Hiraki, M., Kamiya, R. & Hirono, M. SAS-6 is a cartwheel protein that establishes the 9-fold symmetry of the centriole. Curr. Biol. 17, 2169-2174 (2007). 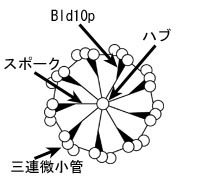 Hiraki, M., Nakazawa, Y., Kamiya, R. & Hirono, M. Bld10p constitutes the cartwheel-spoke tip and stabilizes the 9-fold symmetry of the centriole. Curr. Biol. 17, 1778-1783 (2007). Marshall, W. F. Centriole assembly: The origin of nine-ness. Curr. Biol. 17, R1057-R1059 (2007). Lartigue, C. et al. Genome transplantation in bacteria: Changing one species to another. Science 317, 632-638 (2007). Maruyama, S. & Nozaki, H. Sequence and intranuclear location of the extrachromosomal rDNA plasmid of the amoebo-flagellate Naegleria gruberi. J. Eukaryot. Microbiol. 54, 333-337 (2007). Feldman, J. L., Geimer, S. & Marshall, W. F. The mother centriole plays an instructive role in defining cell geometry. PLoS Biol. 5 1284-1297 (2007). Robinson, R. Centrioles position the nucleus and one another. PLoS Biol. 5, 1190 (2007). Howe, C. J. & Purton, S. The little genome of apicomplexan plastids: Its raison d'etre and a possible explanation for the ‘delayed death’ phenomenon. Protist 158, 121-133 (2007). Storici, F., Bebenek, K., Kunkel, T. A., Gordenin, D. A. & Resnick, M. A. RNA-templated DNA repair. Nature 447, 338-341 (2007). Liu, R. & Ochman, H. Stepwise formation of the bacterial flagellar system. Proc. Natl. Acad. Sci. USA 104, 7116-7121 (2007). Robertson, M. P. & Scott, W. G. The structural basis of ribozyme-catalyzed RNA assembly. Science 315, 1549-1553 (2007). Joyce, G. F. A glimpse of biology's first enzyme. Science 315, 1507-1508 (2007). Hohn, M. J., Park, H.-S., O'Donoghue, P., Schnitzbauer, M. & Söll, D. Emergence of the universal genetic code imprinted in an RNA world. Proc. Natl. Acad. Sci. USA 48, 18095-18100 (2006). Nagawa, F. et al. Antigen-receptor genes of the agnathan lamprey are assembled by a process involving copy choice. Nat. Immunol. 8, 206-213 (2007). Segal, E. et al. A genomic code for nucleosome positioning. Nature 442, 772-778 (2006). Richmond, T. J. Predictable packaging. Nature 442, 750-752 (2006). Mair, G. R. et al. Regulation of sexual development of Plasmodium by translational repression. Science 313, 667-669 (2006). Hajduk, S. L. Timing the sexual development of parasites. Science 313, 626-627 (2006). Dolezal, P., Likic, V., Tachezy, J. & Lithgow, T. Evolution of the molecular machines for protein import into mitochondria. Science 313, 314-318 (2006). Losev, E. et al. Golgi maturation visualized in living yeast. Nature 441, 1002-1006 (2006). Matsuura-Tokita, K., Takeuchi, M., Ichihara, A., Mikuriya, K. & Nakano, A. Live imaging of yeast Golgi cisternal maturation. Nature 441, 1007-1010 (2006). Malhotra, V. & Mayor, S. The Golgi grows up. Nature 441, 939-940 (2006). de Andrade Rosa, I. et al. Cardiolipin in hydrogenosomes: Evidence of symbiotic origin. Eukaryotic Cell 5, 784-787 (2006). Dolezal, P. et al. Giardia mitosomes and trichomonad hydrogenosomes share a common mode of protein targeting. Proc. Natl. Acad. Sci. USA 102, 10924-10929 (2005). Dyall, S. D. et al. Non-mitochondrial complex I proteins in a hydrogenosomal oxidoreductase complex. Nature 431, 1103-1107 (2004). Dühring, U., Axmann, I. M., Hess, W. R. & Wilde, A. An internal antisense RNA regulates expression of the photosynthesis gene isiA. Proc. Natl. Acad. Sci. USA 103, 7054-7058 (2006). Golden, S. S. Good old-fashioned (anti)sense. Proc. Natl. Acad. Sci. USA 103, 6781-6782 (2006). Bringmann, H. & Hyman, A. A. A cytokinesis furrow is positioned by two consecutive signals. Nature 436, 731-734 (2005). Yuan, G.-C. et al. Genome-scale identification of nucleosome positions in S. cerevisiae. Science 309, 626-630 (2005). Marx, J. Nucleosomes help guide yeast gene activity. Science 308, 1724 (2005). Schuwirth, B. S. et al. Structures of the bacterial ribosome at 3.5 Å resolution. Science 310 827-834 (2005). Moore, P. B. A ribosomal coup: E. coli at last! Science 310, 793-795 (2005). Charon, N. W. Mycoplasma takes a walk. Proc. Natl. Acad. Sci. USA 102, 13713-13714 (2005). Uenoyama, A. & Miyata, M. Gliding ghosts of Mycoplasma mobile. Proc. Natl. Acad. Sci. USA 102, 12754-12758 (2005). Blower, M. D., Nachury, M., Heald, R. & Weis, K. A Rae1-containing ribonucleoprotein complex is required for mitotic spindle assembly. Cell 121, 223-234 (2005). Dasso, M. New cog for a familiar machine. Nature 435, 899-900 (2005). Spilianakis, C. G., Lalioti, M. D., Town, T., Lee, G. R. & Flavell, R. A. Interchromosomal associations between alternatively expressed loci. Nature 435, 637-645 (2005). Kioussis, D. Kissing chromosomes. Nature 435, 579-580 (2005). Waschuk, S. A., Bezerra, Jr., A. G., Shi, L. & Brown, L. S. Leptosphaeria rhodopsin: Bacteriorhodopsin-like proton pump from a eukaryote. Proc. Natl. Acad. Sci. USA 102, 6879-6883 (2005). Nakajima, M. et al. Reconstruction of circadian oscillation of cyanobacterial KaiC phosphorylation in vitro. Science 308, 414-415 (2005). Dion, M. F., Altschuler, S. J., Wu, L. F. & Rando, O. J. Genomic characterization reveals a simple histone H4 acetylation code. Proc. Natl. Acad. Sci. USA 102, 5501-5506 (2005). Kürner, J., Frangakis, A. S. & Baumeister, W. Cryo-electron tomography reveals the cytoskeletal structure of Spiroplasma melliferum. Science 307, 436-438 (2005). Indjeian, V. B., Stern, B. M. & Murray, A. W. The centromeric protein Sgo1 is required to sense lack of tension on mitotic chromosomes. Science 307, 130-133 (2005). Kitajima, T. S., Kawashima, S. A. & Watanabe, Y. The conserved kinetochore protein shugosin protects centromeric cohesion during meiosis. Nature 427, 510-517 (2004). Saiardi, A., Bhandari, R., Resnick, A. C., Snowman, A. M. & Snyder, S. H. Phosphorylation of proteins by inositol pyrophosphates. Science 306, 2101-2105 (2004). York, J. D. & Hunter, T. Unexpected mediators of protein phosphorylation. Science 306, 2053-2055 (2004). Kim, M. et al. The yeast Rat1 exonuclease promotes transcription termination by RNA polymerase II. Nature 432, 517-522 (2004). West, S., Gromak, N. & Proudfoot, N. J. Human 5'→3' exonuclease Xrn2 promotes transcription termination at co-transcriptional cleavage sites. Nature 432, 522-525 (2004). Teixeira, A. et al. Autocatalytic RNA cleavage in the human β-globin pre-mRNA promotes transcription termination. Nature 432, 526-530 (2004). Tollervey, D. Termination by torpedo. Nature 432, 456-457 (2004). Corey, D. P. et al. TRPA1 is a candidate for the mechanosensitive transduction channel of vertebrate hair cells. Nature 432, 723-730 (2004). Ashmore, J. Channel at the hair's end. Nature 432, 685-686 (2004). Chang, P., Jacobson, M. K. & Mitchison, T. J. Poly(ADP-ribose) is required for spindle assembly and structure. Nature 432, 645-649 (2004). Karsenti, E. Spindle saga. Nature 432, 563-564 (2004). Dorigo, B. et al. Nucleosome arrays reveal the two-start organization of the chromatin fiber. Science 306, 1571-1573 (2004). Francis, N. J., Kingston, R. E. & Woodcock, C. L. Chromatin compaction by a polycomb group protein complex. Science 306, 1574-1577 (2004). Mohd-Sarip, A. & Verrijzer, C. P. A higher order of silence. Science 306, 1484-1485 (2004). Mihalcescu, I., Hsing, W. & Leibler, S. Resilient circadian oscillator revealed in individual cyanobacteria. Nature 430, 81-85 (2004). Johnson, C. H. As time glows by in bacteria. Nature 430, 23-24 (2004). Viollier, P. H. et al. Rapid and sequential movement of individual chromosomal loci to specific subcellular locations during bacterial DNA replication. Proc. Natl. Acad. Sci. USA 101, 9257-9262 (2004). Gitai, Z., Dye, N. & Shapiro, L. An actin-like gene can determine cell polarity in bacteria. Proc. Natl. Acad. Sci. USA 101, 8643-8648 (2004). Fiebig, A. & Theriot, J. A. Bacteria make tracks to the pole. Proc. Natl. Acad. Sci. USA 101, 8510-8511 (2004). Godi, A. et al. FAPPs control Golgi-to-cell-surface membrane traffic by binding to ARF and PtdIns(4)P. Nature Cell Biol. 6, 393-404 (2004). Roth, M. New candidates for vesicle coat proteins. Nature Cell Biol. 6, 384-385 (2004). 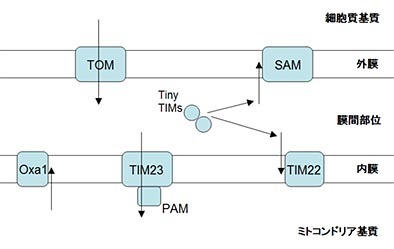 Itoh, T. & De Camilli, P. Dual-key strategy. Nature 429, 141-142 (2004). Tiscornia, G., Tergaonkar, V., Galmii, F. & Verma, I. CRE recomnbinase-inducible RNA interference mediated by lentiviral vectors. Proc.Natl.Adcd Sci USA 101, 7347-7351 (2004). Hutvágner, G., Simard, M. J., Mello, C. C. & Zamore, P. D. Sequence-specific inhibition of small RNA function. PLoS Biol. 2, 465-475 (2004). Paddison, P. J. et al. A resource for large-scale RNA-interference-based screens in mammals. Nature 428, 427-431 (2004). Berns, K. et al. A large-scale RNAi screen in human cells identifies new components of the p53 pathway. Nature 428, 431-437 (2004). Fraser, A. Human genes hit the big screen. Nature 428, 375-378 (2004). Winkler, W. C. et al. Control of gene expression by a natural metabolite-responsive ribozyme. Nature 428, 281-286 (2004). Cech, T. R. RNA finds a simpler way. Nature 428, 263-264 (2004). Marston, A. L.. Tham, W.-H., Shah, H. & Amon, A. A genome-wide screen identifies genes required for centromeric cohesion. Science 303, 1367-1370 (2004). Ogawa. T., Nitta, R., Okada, Y. & Hirokawa, N. A common mechanism for microtubule destabilizers - M type kinesins stabilize curling of the protofilament using the class-specific neck and loops. Cell 116, 591-602 (2004). Ems-McClung, S. C. & Walczak, C. E. Catastrophic kinesins: Piecing together their mechanism by 3D reconstruction. Cell 116, 485-486 (2004). Temiakov, D. et al. Structural basis for substrate selection by T7 RNA polymerase. Cell 116, 381-391 (2004). Yin, Y. W. & Steitz, T. A. The structural mechanism of translocation and helicase activity in T7 RNA polymerase. Cell 116, 393-404 (2004). Landick, R. Active-site dynamics in RNA polymerases. Cell 116, 351-353 (2004). Palazzo, A. F. et al. Localized stabilization of microtubules by integrin- and FAK-facilitated Rho signaling. Science 303, 836-839 (2004). del Pozo, M. A. et al. Integrins regulate Rac targeting by internalization of membrane domains. Science 303, 839-842 (2004). Guan, J.-L. Integrins, rafts, Rac, and Rho. Science 303, 773-774 (2004). Allshire, R. Guardian spirit blesses meiosis. Nature 427, 495-497 (2004). Klevecz, R. R., Bolen, J., Forrest, G. & Murray, D. B. A genomewide oscillation in transcription gates DNA replication and cell cycle. Proc. Natl. Acad. Sci. USA 101, 1200-1205 (2004). Young, M. W. An ultradian clock shapes genome expression in yeast. Proc. Natl. Acad. Sci. USA 101, 1118-1119 (2004). Yildiz, A., Tomishige, M., Vale, R. D. & Selvin, P. R. Kinesin walks hand-over-hand. Science 303, 676-678 (2004). Crawford, G. E. et al. Identifying regulatory elements by genome-wide recovery of DNase hypersensitive sites. Proc. Natl. Acad. Sci. USA 101, 992-997 (2004). Osteryoung, K. W. The division of endosymbiotic organelles. Science 302, 1698-1704 (2003). Giot, L. et al. A protein interaction map of Drosophila melanogaster. Science 302, 1727-1736 (2003). Journet, L., Agrain, C., Broz, P. & Cornelis, G. R. The needle length of bacterial injectisomes is determined by a molecular ruler. Science 302, 1757-1760 (2003). Gibbs, W. W. The unseen genome: gems among the junk. Sci. Am. 289 (5), 26-33 (2003). Gibbs, W. W. The unseen genome: beyond DNA. Sci. Am. 289 (6), 78-85 (2003). Hirotsune, S. et al. An expressed pseudogene regulates the messenger-RNA stability of its homologous coding gene. Science 423, 91-100 (2003). Knight, J. Switched on to RNA. Nature 425, 232-233 (2003). Carrington, J. C. & Ambros, V. Role of microRNAs in plant and animal development. Science 301, 336-338 (2003). Gao, H., Kadirjan-Kalbach, D., Froehlich, J. E. & Osteryoung, K. W. ARC5, a cytosolic dynamin-like protein from plants, is part of the chloroplast division machinery. Proc. Natl. Acad. Sci. USA 100, 4328-4333 (2003). McFadden, G. I. & Ralph, S. A. Dynamin: The endosymbiosis ring of power. Proc. Natl. Acad. Sci. USA 100, 3557-3559 (2003). Nishida, K. et al. Dynamic recruitment of dynamin for final mitochondrial severance in a primitive red alga. Proc. Natl. Acad. Sci. USA 100, 2146-2151 (2003). Winkler, W., Nahvi, A. & Breaker, R. R. Thiamine derivatives bind messenger RNAs directly to regulate bacterial gene expression. Nature 419, 952-956 (2002). Szostak, J. W. RNA gets a grip on translation. Nature 419, 890-891 (2002).